Salts are ionic compounds that result from the neutralization reaction of an acid and a base. Double salts are compounds obtained by combination of two different salts which were crystallized in the same regular ionic lattice. 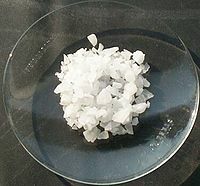 An example of a double salt is alum. Having an extra charged particle allows it to bind well with both the dye and the fibre to which the dye is being applied. This process of bonding in dyeing is commonly known as mordanting. Note that double salts should not be confused with a complex compound. When dissolved in water, a double salt completely dissociates into simple ions while complex compounds do not, the complex ion remaining unchanged in the later. True alums have commonly been recognized as double salts of aluminum, such as potassium aluminum sulfate (left) – KAl(SO4)2. Aluminum sulfate (right) – Al2(SO4)3 – is commonly known as an alum, although it is not a double salt. Aluminum sulfate is the result of the refining process of bauxite which is the raw state of aluminum ore. During this refining process sulfuric acid is used to remove most of the iron and silica present in bauxite. The difference between these two may be subtle but may drastically show different dye results.Test the mordant with the dye you want to use. Study the Material Safety Data Sheet (MSDS) to determine if the aluminum sulfate you use has iron in it or is refined with potassium. Iron will also affect the dye’s outcome. Additionally, the type of pot used in the dyeing process can also affect the dyeing outcome. Differences can happen whether you use stainless steel, aluminum, or iron pots during mordanting and dyeing. Today I found a source of aluminum sulfate for less than a dollar a pound and reserved a 20 kg. bag with which to experiment in the coming weeks. Its MSDS will be telling. But even in the event of its containing iron it may have a use. Another common source for potassium alum is an Indian grocery store…look in the personal hygiene section for antiperspirant/antiseptic/aftershave bars – these are often made from potassium alum. Trying them as a mordant would be more than worth the effort.